Considering a Markforged printer? Now, you can access our complete Eiger software in the cloud to experience setting up parts on our award winning printers. Last week, we introduced another software update to Eiger providing some valuable features for new and current users. We've updated the Eiger sign-up workflow, making it easier for you to try out our software before getting a printer. 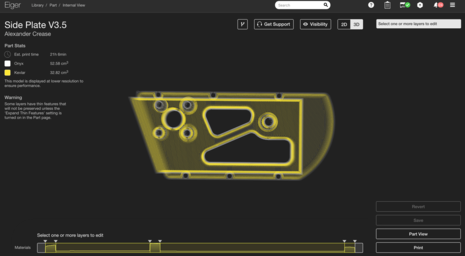 We've also added some tools in Eiger to provide weight and material cost information about sliced parts. Try out Eiger to discover how our products can improve your design workflow. 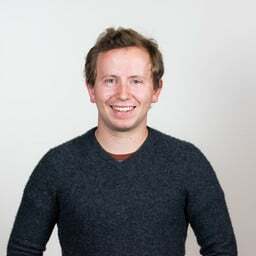 Eiger, the software that slices parts for all Markforged printers, was designed as a production quality slicer and file management solution for customers. Eiger is designed walk you through printing with our unique CFF (Continuous Fiber Fabrication) process, giving you full control over how your part is reinforced with composite fibers. As an organization tool, it also allows for part sharing, version control, and print monitoring. Now anyone can experience Markforged's Eiger software and learn what it takes to create strong 3D printed parts in various composite materials. Sign up to test out the software that controls our award-winning machines. 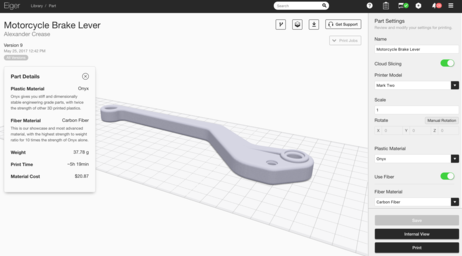 ‍Try out Eiger by uploading parts and slicing them with various fiber and plastic settings. Anyone can create an Eiger account, so those without printers can test out our software capabilities. You can import STL files and experiment with any of the print settings, fiber routing options, or configurations that you would use with the printer. You also have access to all of the file management and organization infrastructure Eiger provides - share parts with colleagues within your organization, and access projects and version history of each part. Parts can be sliced and fiber routing can be configured just like in a full account, but cannot be sent to printers or exported. While Eiger without a printer has a 30 part limit and does not permit cloud based slicing, registering a printer will open up the software to its full form. The printer can be added directly to the original organization for a seamless transition to a full featured account with unlimited parts and cloud-based slicing access. Upon signing up you'll receive guides on fiber reinforcement to help you take your beginning steps in the software. 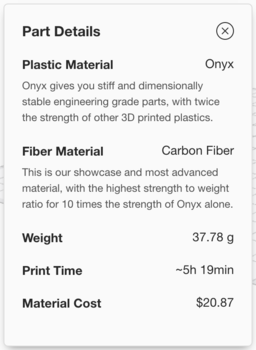 You can also check out some of the newest features we have added to Eiger, including, part weight and cost estimates! Click “Part Details” below the part name for the specifications. ‍The “Part Details” dropdown enumerates the part weight, print time, and total material cost, and provides descriptions of each material on screen. One of the great new features of this tool is the weight estimation it gives. The estimation uses the densities provided on our material data sheet to approximate part weight. 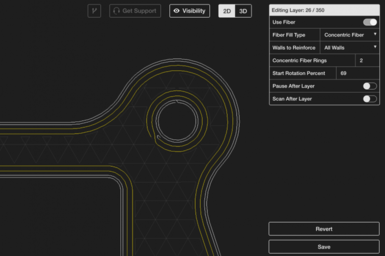 Whether you are weight limited by the tooling for a robotic end-effector, or you want to save weight a racing vehicle, the tool makes it easier to budget weight effectively for your designs. When your part slices, the weight of the part will automatically update to reflect the current print settings. For many print services and shops using our products, generating quotes has become even easier. Eiger now provides the total material cost of the part, so you can easily use the part cost calculator to help price out your jobs. ‍By efficiently routing fiber within your printed parts, you can maximize strength while keeping material cost low. This tool as a whole provides greater transparency over part cost and fiber routing efficiency. While our printer has the ability to reinforce 3D printed parts with continuous fibers, designing strong parts that are also cost effective is important. Using the cost estimate tool, you can implement different fiber routing techniques to compare costs. For more information on efficient fiber routing techniques, read more here. To try out the fiber routing yourself, and check out the other new features, try out Eiger today. 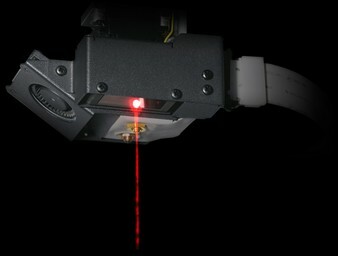 Our new printer, the Mark X, includes a laser that performs in-process inspection on 3D printed parts. This blog explains the device's form and function. You’re going to flip when you try out the new feature in Eiger. We’ve launched automatic rotation to enhance our software platform once again. You asked and we delivered: with the latest Eiger software update comes internal reinforcement options.